It really was a case of Homos and Tabuli versus Napolitana and Bolognese. A fabulous restaurant in Mortlake, just a three minute drive from Concord's Majors Bay Road was where it all happened. We were lost, it looked like a warehouse from the outside but on the inside, the aroma of fresh made pizza, falafels, Bolognese and Shish Tawouk (chicken kebabs) filled my nostrils. It was pure pleasure in one place, so we sat and ordered. We shared a Matt's special, oh my, most of the Lebanese foods on a three tier tray served with a bread basket on the side. 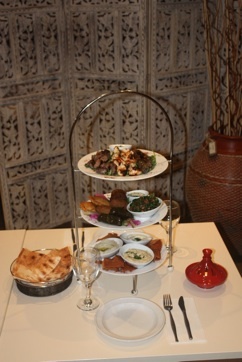 The garlic chicken kebabs, beef kebabs and kafta on the top tier. Their homemade falafels, vegetarian vine leaves, tahini sauce and tabuli on the second tier. The bottom tier had three dip plates that just complimented the meats, Baba Gannoush, Homos and Lubni (minted yoghurt). So much delight in one serving. We made the mistake of ordering too much, a Fettuccini Boscaiola and a medium Rocket Pizza because we thought we'd still be hungry but no, they went in our doggy bag and both tasted great the next day. A warm and inviting BYO family restaurant, where the cook is the female owner and her boys and husband make the pizzas. An absolutely delightful experience that we would visit again and again, just to make sure we get to have everything on the menu. Family ambiance with a quiet romantic function room for those who want it. Fabulous! An inexpensive treat that opens from Tuesday through to Sunday.view here for you to view their menu and enquiries. When: Open Tuesday to Sunday from 5pm.